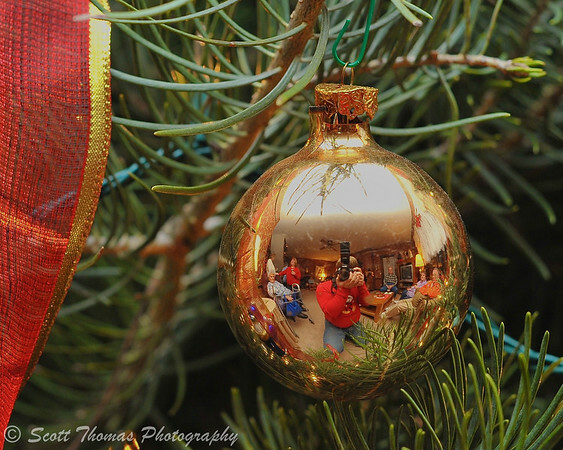 A room full of people enjoying a family Christmas party reflected in an ornament. Nikon D700/50mm, 1/40s, f/4.5, ISO 640, EV 0, bounce flash at -1.0 power. It was a weekend of Christmas parties. The last one I enjoyed was in a home decorated with Christmas trees in every room and many Santa figurines found throughout including the bathrooms. The ornament photo not only shows some of the people at the party but the effect of bouncing a flash off a ceiling thereby creating a large even light source. Santa Clause figurine. Nikon D700/50mm, 1/40s, f/2.8, ISO 640, EV 0, bounce flash at -1.0 power. 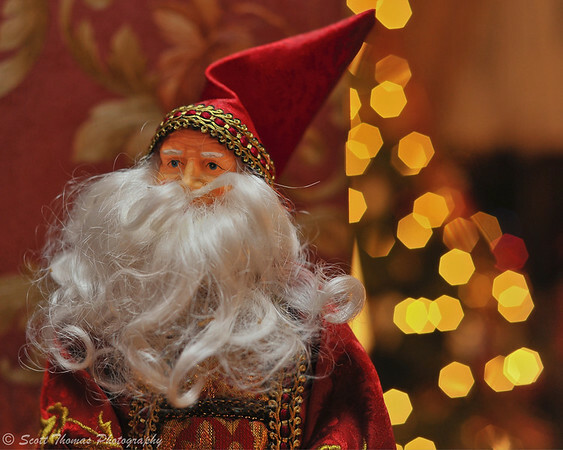 I used my Nifty-Fifty, the Nikon 50mm f/1.8 lens, to control the depth of field and create Christmas light bokeh behind one of the Santa Clause figures in the party host’s home. 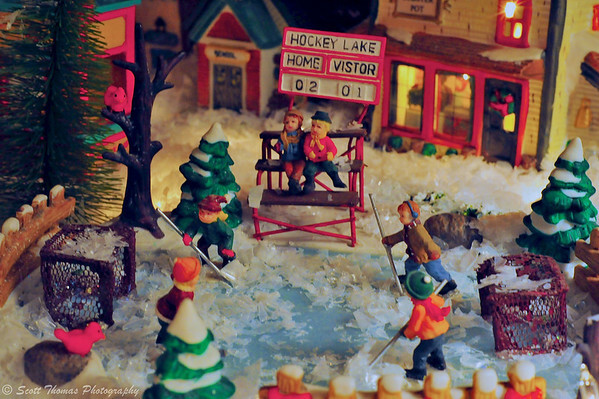 The home features a large holiday miniature village with a hockey game going on. Nikon D700/50mm, 1/25s, f/11, ISO 3600, EV 0. Any miniature holiday village with a hockey game going on is going to get photographed by me. 🙂 The two spectators must be pleased as the Home team is winning. This entry was posted in Weekly View and tagged 50mm, bokeh, bounce, christmas, decorations, flash, holiday, nifty fifty, nikon D700, nikon SB-600, ornament, party, santa clause, tree. Bookmark the permalink. Beautiful photos, Scott. I really like the Santa… and the first one reminded me that I wanted to get shiny ornaments for our tree this year, for some reflection pictures (forgot all about it…. there’s always next year). All my glass ball ornaments have a matte finish. What I like about bouncing light is the opportunity to paint with light. Not in the abstract sense but in a sort of neo-realism. I like the ornament shot a lot. Thanks, BM! Have you used off camera flash? It is easy with the Nikon CLS system. Okay, that’s pretty neat, and a great idea with that first image. Your skills are expanding, as well as your motivations for shots no one else has thought of. I try, Mitch, and it is fun to learn and try new ways to photograph the world around me. That Santa Clause yellow light is real nice, very creative made. I like the first photo, too, all those people in a tiny glass ornament,- that is good work 🙂 It is interesting to look at. I am happy you find it interesting and good. Thanks, Birgitte. Now I think you should find a way to imprint that first shot on a glass ball that can hang on the tree next year. Heh heh. I covet the hockey game. If I ever make a village I must remember to include a hockey surface just like the ones kids made in Detroit. I miss hockey. It’s the only good reason for having a TV. Not sure I could do that on a glass ball but a hanging ornament with that photo would be cool. Check out your local high school games, Gerry. Dress warm, bring a thermos of your favorite hot beverage and enjoy a game. although I didn’t have room for it this year – but without hockey. Someday you might have a flash unit and you’ll remember this. There are devices which bounce/reflect/diffuse the pop-up flash on your camera you might want to look for. We should see if you can use my old attachment flash on your new camera. Seems like you could since you can use the old lenses. Thank you, Consuelo! It is a nice reminder of a holiday evening with family. That first shot is so creative – I like shots that allow you to see more the more you look. Thanks, YB! And a Happy Christmas to you! I like that first photo of the family and you reflected in the shiny ball ornament. I wish you and your own family a happy Christmas, Scott! Thank you, Truels! May yours be happy and merry, too. Notice the way I am holding my camera. Even with a 50mm, holding the camera correctly makes for sharp photos. Wonderful shots, Scott. Many might not think to use flash in these sort of shots but I have found it to be very useful (especially rear curtain flash during slow shutter shots) to bring out the details while still getting that Christmas ‘glow’. Well done and nice lesson!